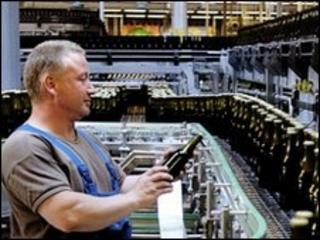 Profits at the Danish brewer Carlsberg have been hit by a Russian beer tax, falling by 7% in the first 3 months of 2010. Operating profit fell to 735m kroner ($125.2m; £84.4m) from 788m kroner last year. However, the figure was better than analysts had predicted and Carlsberg's shares rose on the news. Sales in Carlsberg's key region of Russia fell by 12% after the government tripled the tax on beer. The fall was partly offset by improving sales in Western Europe and Asia where volumes grew 3% and 16% respectively. Carlsberg says that it is still aiming for 20% net profit growth in 2010 and it anticipates "outperforming the market".